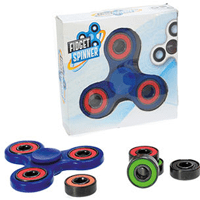 This is one of the most stylish fidget spinners we have ever seen and you can get your free fidget spinner now worth £6.99 for completely free. It comes in 4 different colours including black, red, aqua and berry and you can get up to 3 minutes of spinning action. To get this spinner freebie click “GET IT HERE” and you will be sent to TopCashBack site, you can to sign up then you will be sent to Argos site and its item number 717/7486. Buy the product then get a full refund.